Last month I shared about the “first kiss” scene in An Informal Christmas. This month we’re going to take a peek at some kissing advice in An Informal Arrangement. What’s the best #kissingadvice you ever received? Holden is in the hospital, and he’s finally hungry for real food again. To celebrate, his nurse ordered him a bacon-rich meal from the cafeteria. You may wonder what bacon has to do with kissing, but… Well, you’ll just have to read it for yourself. The fragrance of salted paradise on a plate reached Holden ahead of the voice. “I don’t know what you did to warrant such treatment, but whatever it was, I hope some of it rubs off on me.” An older gentleman stood in the doorway holding a breakfast tray. Kissing? Holden could imagine his mom’s horrified reaction. But then, her advice centered on landing him a wife. He wanted to find the woman God had for him and settle down. It still irked, though, when his family treated him as if he were incapable of convincing a woman to marry him. Hence all their outdated but well-intentioned counsel. Holden and Maddie don’t make it to their first kiss until much later in the book, and I don’t want to spoil the story for you by giving away that particular scene. So if you want to find out whether or not Holden puts the kissing advice to good use, you can purchase An Informal Arrangement here or you can enter the giveaway below. 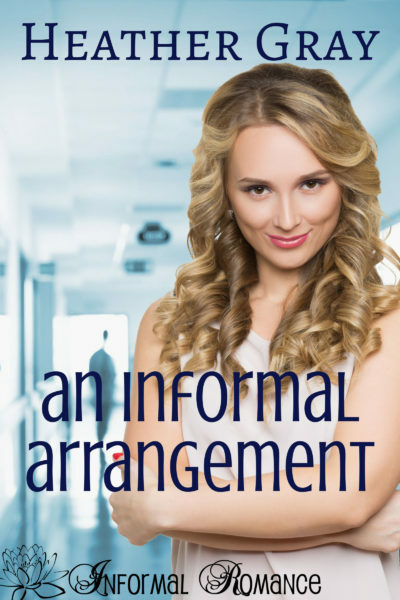 GIVEAWAY: Enter to win a complimentary e-book copy of An Informal Arrangement. To enter, comment below with the best kissing advice you’ve ever given, received, overheard, or borrowed. Comments are always welcome, but the giveaway will close at midnight on the night of July 1st. The winner will be announced in the July 3rd Sunday Edition right here on the blog. Funny, I can’t say I’ve ever received any advice on kissing…does that mean I’m doing it right? :) I’ll be anxious to read the comments, Heather. 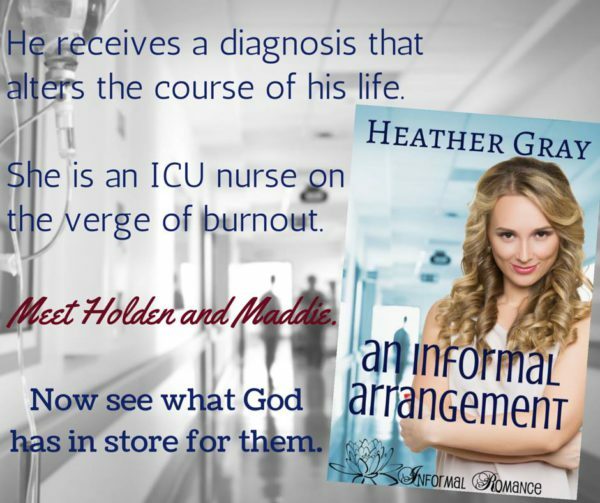 Thanks for sharing an excerpt! In our family, when our sons and grandkids see us kiss and remark “Oh, yucky!” We tell them “you are not allowed to kiss until they are 30” and kiss them. While we would not enforce this rule, we understand how passionate teen kisses can ignite deeper emotions. This teasing statement gives us the opportunity to discuss when and how during a relationship it is appropriate to kiss. Open dialog is important between parents and children. Heather, good kissing advice after marriage. I so agree with you! It’s important for adults and children to have an open dialogue about relationships, kissing, and physical intimacy in general. In order for us to have that open dialogue, we need to look for and use those teachable moments. When we work those sorts of things into daily conversation, then we create a situation where our children (or grandchildren) feel comfortable talking about those things with us. Excellent point!! I’m not sure I’ve ever been given kissing advice. But I do like kissing. :) and I love Holden and Maddie’s story. If you’ll pardon my comment here, I wrote it into a recent release that a woman puts on bright red lipstick (she’s the best friend of the heroine). The heroine makes a remark that her friend has never really cared about wearing makeup before. The friend is still pretty much a newlywed and makes the comment that she wears it for special occasions because her husband told her he loves seeing her wearing red lipstick. So, I found Katy’s comment amusing and…timely. :) And my heroine’s name is Caty, fyi. I don’t remember getting any kissing advice either, or giving any. I didn’t even have a date until I was in college! I’ve not really received, given, overheard, or borrowed any kissing advice, but your book sounds very interesting. So glad you could stop by today Andrea! I’m with many who say they’ve never received kissing advice, but I’ve given it. My husband and I have photographed many weddings and one of the many advices we gave throughout the day the one that always got a high five from the groom and a blush from the bride was when we’d tell them, “When the pastor tells you to kiss the bride, hold it until you hear people snicker.” The reason begin, not so they can have a long kiss, but for us to get just the right photo of their kiss. To often when they’re nervous they just do a peck and we needed a bit longer for a good photo. That’s such great advice – both for the photography and for the memories it probably creates for the happy couple! I have a friend who – along with her husband – recently started a wedding photography business. I’m going to pass this along to her. Thank you so much for sharing Marylin!! My husband and myself kiss more times than I could count in a day. We feel it strengthens our relationship and keeps us feeling young even though we are in our 50’s. As for advice, who needs it. You do what feels right for you. I can’t think of any kissing advice I’ve ever been given or have had given to me. I do know that I love experiencing forehead kisses from my husband and reading about them in books. I think they’re so sweet. I don’t know what it is about them, but it makes me feel treasured and makes me feel like the characters in a book treasure each other. No kissing advice from this corner. The best kissing advice I ever got was from my parents. It wasn’t anything they said, it was the warm and affectionate embraces and kisses they shared every single day. Of course when I was in high school and had friends over it was mortifying. They were married 56 years when my mom died and my father said till he died he couldn’t believe how blessed he was to marry her. Best advice by far! Thank you for sharing Sharon! What a blessing to have grown up with such a wonderful example of love and marriage! Don’t wait. Kiss him first. That’s how I won my man.